If you’re like me, you want to be able to use your aromatherapy in every room of your house without overwhelming it. Between my kids, their activities, and the errands I do each day, I don’t have time to sit and relax. This is where my mini essential oil diffuser comes in. I like essential oil diffusers that can run in smaller spaces like my bathroom or in the smaller rooms I have in my house because they let me just stand for a few minutes and relax. I’m going to give you five of my favorite mini essential oil diffusers along with a detailed guide that tells you exactly what you want to consider when you shop. What is a Mini Essential Oil Diffuser? As it sounds, a mini essential oil diffuser can do everything a regular essential oil diffuser can do but on a more compact scale. It’s a more compact version that doesn’t put out as much of the essential oil scent or droplets when it runs. This can make it ideal for using it in smaller rooms like the bathroom, closets, or in something like an RV. You can typically find mini essential oil diffusers in the same styles that you’d find the regular diffusers in, and this is great because it can save you from testing out multiple ones when you’re trying to find the best fit. Basically, this mini diffuser works to spread microscopic droplets of oil throughout your room. Some have you mix essential oils, and water and others use plain essential oil. They’re a good alternative to use if you want something that will only run for a few hours before it shuts off. This type of diffuser utilizes a small fan to change the essential oil from a liquid to a gas before pushing it into the surrounding air. You put the essential oils on filter or pad below the fan and switch it on. They quickly disperse the oils through your air. Heat diffusers are quiet and inexpensive. They use heat to disperse your essential oils throughout your room, but the heat changes the oil’s molecular makeup. Nebulizers use an atomizer to help break down the essential oils and disperse them into the air. It doesn’t use water or heat to do so, and this allows you to get stronger scents. Also, the tiny molecules are easier to absorb into your body. Ultrasonic diffusers have parts that vibrate at a very fast frequency. These frequencies are what dispel the essential oil into the air. They mix oil and water to work, and this means that this diffuser can double as a humidifier in any room that you run it in. Once you pick a diffuser, you’re ready to start comparing various mini essential oil diffusers. This will help to ensure that your new diffuser works as you need it to work. Your diffuser’s design gives you direct clues to how well it’ll fit into your lifestyle. Since the diffusers in my guide are mini, they’re small and lightweight. You have to decide whether or not you plan to take your diffuser with you or use it largely at home. For home use, you can find a diffuser that suits your home’s colors and decor. For travel, having one that runs on alternate power sources is a must. Your diffuser’s ease of use or the functionally should be at the top of your list. You don’t want to spend ages trying to get your diffuser set up and running, and a user-friendly option with a straightforward design is a good idea. Consider whether or not you plan to monitor your diffuser if you choose one with a heat source, and it’s also a good idea to check how long the diffuser runs for between fills. Your mini diffusers tend to have a lower point of gravity due to their compact size, but stability is a must. You don’t want your diffuser to tip over if you should happen to bump it and get your essential oils or oil and water mixture all over. Look for a diffuser with a wider base that tapers up to a more slender top. Even mini diffusers come with times built right into them. They allow you to set your diffuser to spray or run for 30 minutes, an hour, two hours, three hours and more. Most mini diffusers can run for a maximum of four to six hours before they shut off. Automatic shutoff should be a safety feature you want to avoid burning out your diffuser. Although we outlined the various types of diffusers earlier, it’s a critical part of the decision making process. For example, a nebulizer can help you unleash your oil’s full potential while an ultrasonic diffuser comes with a humidifier to add moisture into your air. Candle diffusers are also available. However, we do not recommend these diffusers because an open flame is dangerous. There are dozens of benefits that come with having and using a mini essential oil diffuser. I’ve narrowed down the top ones because I want you to have all of the information you need to make an informed choice. 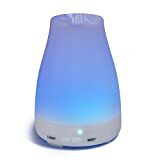 The biggest benefit of a mini essential oil diffuser is the aromatherapy benefits. A mini diffuser makes it possible to get your aromatherapy benefits in all of the rooms in your house, even the smaller ones! You can mix your oil blends or use your favorite oil without worrying about overwhelming smaller spaces. Mini essential oil diffusers come with a huge convenience factor that drives people to purchase them. For starters, they only need a very small space to work. Their size makes them highly portable as well because the more compact design ensures that they’re lightweight enough to move around. Did you know that essential oils can have properties that help to fight fungus, bacterial, and viral infections? When you use your mini essential oil diffusers with these oils, it can work to purify the air around you. In turn, this can lead to improved air quality. Unlike larger diffusers that you may have a hard time finding space for, mini essential oil diffusers are different. They give you the flexibility and freedom to place them on just about any surface without a problem. Whether you have a small desk, table, or some other small stand, you should be able to put this diffuser on any one of them. I’ve done a lot of research into mini essential oil diffusers. Additionally, I’ve compared a lot of products to find my top five recommended mini essential oil diffusers. I’ll highlight what makes them so great below! 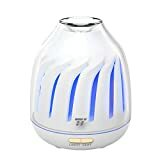 This LED essential oil diffuser emits a soft glow with a silent operation that makes it perfect for use in your bedroom. It runs for a full three hours at a constant pace, or you can choose an intermittent mode that runs for six hours. The solid wood base makes this a very stable diffuser. It also doubles as humidifier that adds moisture into the air to make it easier to sleep. The small and compact design allows you to set it on your nightstand or another small table by your bed without taking up too much room. This diffuser comes with a silent operation that can run for four to eight hours depending on which setting you have it on. The five bright LED colors can give a soothing experience, and you can set them to stay on one light or switch. The 120mL tank has an automatic shutoff feature that prevents the diffuser from burning out when it runs out of water. It also has a soft white outer color that blends well with many nursery decors. This diffuser can humidify the air in your child’s nursery as well. 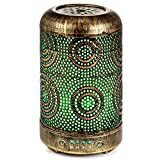 This fun and rustic mini essential oil diffuser features bright LED colors underneath a durable and rustic metal cover. Hand-painted and finished with copper, this mini essential oil diffuser masterfully ties together two different styles for a unique look. You get four time settings that allow this diffuser to run between three and five hours between filling, and it has an automatic shutoff feature that prevents it from burning out. Producing only 35 decibels of noise, this diffuser runs very quietly in the background of your life with minimal interruptions. Featuring a classic and sleek woodgrain design, this mini essential oil diffuser fits in perfectly with a traditional study or office. It has noise-reducing technology to help cover the sound of the motor. You’ll get a sleek teardrop design with a stable and rounded base. This 130mL mini diffuser has four settings that you can switch out with the push of a button. It comes with completely non-toxic materials, a sleek band of LED colors going around the base, and an automatic shutoff that prevents accidental burnout if the water runs out. 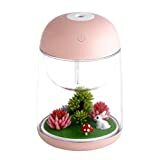 This adorable mini essential oil diffuser features a small landscape scene with small plants, a small mushroom, and a small bunny with a LED light. The scene is safely encased in plastic, and you fill the water and oils at the top. You get several different output cycles, and it plugs into a USB port to charge between runs. It has seven bright LED color options, automatic shutoff, and whisper-quiet operation. Finally, you get a solid and flat base that helps to support your diffuser when it’s full. The mini essential oil diffusers I picked out and reviewed are all great choices for your home or office. They’re all lightweight, small, portable, and convenient. Additionally, some of them can double as humidifiers and nightlights. I like to use them in my kid’s rooms because they’re so quiet. If you don’t have one, I invite you to check out my top picks! If you do, I want to hear about your experience with your mini essential oil diffuser!